Our top local days out are Kia-Ora Mini Farm (between Gorey & Ballymoney about 3 minutes from each) which has a working fire engine, real mini-diggers as well as the usual petting farms and toy tractors and Wells House which has great buggy-friendly forest walks including an appearance by the Gruffalo, a good playground, archery, and a constant fairy door hunt, it’s about 15 mins south of Gorey on the coast road to Wexford. The town park playground in Gorey is great, as you come up town you turn right at Tara Stores and it’s past Paddy Blues pub on the right, you can usually park in the estate past it on the left if the gates are closed to cars. My crew love explorey walks in Courtown Woods and there are fantastic views from Tara Hill, worth the climb and recently done by my 4 and 6 year olds. You park in the entrance on the road between Ballymoney and Tara hill village on the left. Beach wise avoid Courtown it’s overcrowded on hot days, Ballymoney beach is fab, the one over the cliff walk from the sea road carpark has lifeguards and is very safe, and further north Clogga is lovely, head for Castletown. For wet days there’s a cinema on the Courtown road with very cheap kids’ club deals for the 11am shows and a Kidzone soft play in the business park which is signposted from Tesco. There’s a good pool in Courtown and there’s a zipwire course too. Further afield the National Heritage Park at Ferrycarrig outside Wexford town is definitely worth a visit, if you go register the kids when you are going in and you’ll get a map with a quest and they get a little certificate at the end. The coffee shop there is good and there’s a recently added playground at the top of the hill near the archery. For a big daytrip Hook Head is about and hour and a half south, it’s possibly my favourite place on the planet, the scenery is stunning, the lighthouse the “world’s flashiest” and the kids love the drop-in art workshops and the cliffs, and the café is lovely, try the chowder. It’s out on the Hook Peninsula, allow about 90 minutes from Gorey. If you’re down that far check out my beloved Duncannon too. 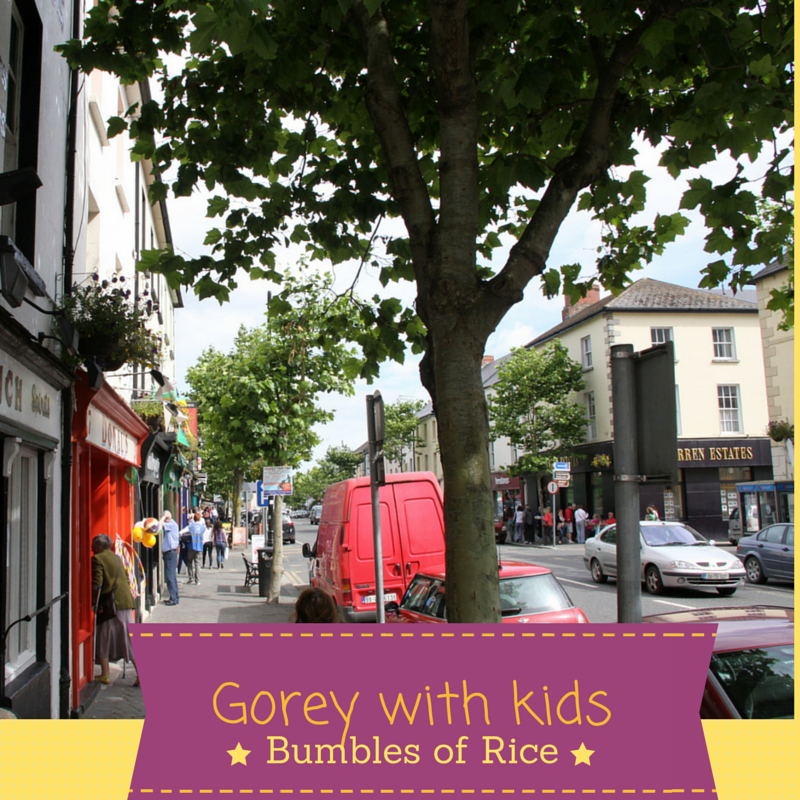 Our favourite restaurant that’s kid friendly is The Kitchen off Gorey main St (turn at Tara Stores), it’s a very cool atmosphere and they serve local and seasonal and while there are chips etc they’re handcut and homemade. Eco Pizzeria at the top of the Main Street opposite AIB is always popular too especially with the kids. There’s a new casual dining restaurant opened at Marlfield House – The Duck which is kid friendly with a “ducklings” menu and is lovely, the cocktails are fabulous for the adults. For proper burgers Route 66 on the Main St. is good, definitely have a milkshake. Katy Daly’s is more traditional pub grub so lots of deep fried but they do a good steak, and their sister restaurant Chill on McDermott St is fancier pub grub. If you fancy fish and chips King Cod (near the Little Theatre) does great old school Italian fish and chips. If your crew like pancakes definitely get to Partridges opposite Supervalu on the Main Street for breakfast, served til 11.30.am. They do a great eggs benedict too, and the bitesized rocky road that’s served with the coffees are very moreish. There’s a new gelato shop opened on Esmonde St in Gorey Scupedoo, it’s fabulous (though expensive if you’ve a gang) and there’s a good reason that there are queues out the door. To find out what’s in Gorey when you’re here check out the Love Gorey website and sign up to their newsletter. And if you enjoy reading Bumbles of Rice I’d really appreciate if you’d consider voting for me in the Boots maternity & infant awards in the Best Parenting Blog category under the For the Family list HERE. bumbles family travels, Gorey, Holidays, holidays with kids, tourism, travel, wexford. Bookmark. Lovely roundup, can I go on holidays here myself? I don’t think I’ve ever heard of Gorey being described so well! Sounds like there’s a million things to do – great post!! Lovely round up, Wexford seems to be a county thats chock full of entertainment for the wee ones!Will have to check it out some time. Only ever there passing through on the way to catch the ferry to France. Thanks, yes, there’s tons to do alright, come visit!